9th annual See What Moves You! 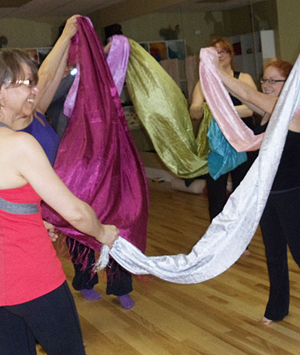 Treat yourself to a wonderful afternoon of music and movement, yoga, and relaxation. Whether you have experienced all three or are new to some or all, you will end the day feeling totally rested and rejuvenated. Most of all, you will have lots of fun. Appropriate for all ages and levels. Cancellation policy: No refunds after October 30, 2018. Note: Payment must be received before registration is complete. Let Your Yoga Dance® is an exciting combination of yoga, choreographed dance, and expressive movement. Its practice enlivens and balances the seven chakras (energy centres) and is set to music from many traditions around the world. Kripalu Yoga is a kind and gentle practice that emphasizes proper breathing and alignment. Each student is encouraged to listen to their own body and work within their individual strengths and degree of flexibility. Yoga Nidra means “yogic sleep” and is also known as Deep Relaxation Journey. It is a systematic method of inducing complete relaxation and peace, not only for the physical body, but also for the deeper emotional and mental systems. Also known as sleep with awareness, Yoga Nidra brings you to a place of deep calm and when you arise, you feel refreshed, alert with more clarity and self awareness.